And, on top of all these powerful persons, there was the tsar – the mightiest, the blessed, the unaccountable. So, one of the tsar’s proclamations in 1906 read like this: “To the Emperor of All the Russias belongs supreme autocratic power. Submission to His power, not only from fear, but as a matter of conscience, is commanded by God himself.” (Geroid Tanquary Robinson, op. cit., Chapter X: “The revolution of 1905: The ebb”) God was, as the king & co. claimed, on their side. And, there were fear and “conscience”. Fearing pressure from below the emperor “emancipated” the slaves; but, the brutal burden increased only as the following paragraphs narrate. 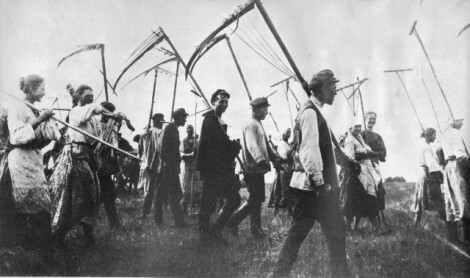 “Under the emancipation, the Russian serfs received their freedom: no longer did the lord of the land exercise direct authority over the peasants, who could now own property and marry without obtaining their master’s permission; no longer were they bought or sold at will; no longer could the master order them to work, send them off to the army to meet draft quota, or banish them to Siberia for acts of subordination. Nevertheless, the serfs’ new found freedom was constrained by their duty to pay a head tax and their continued subjection to customary rather than statutory law. “Much to the displeasure of the serfs, they did not receive all the land to which they thought they were entitled. Rather, in order to provide for the nobility who served as the backbone of the regime, the emancipation statute allowed the landholders to retain approximately 50 percent of the land. Moreover, that portion of the land allocated to the nobility tended to be best portion. Whenever a dispute arose over the division of the land, the nobility usually prevailed. Frequently, they also retained pasture, water, and forest rights at the expense of the newly emancipated serfs. “Not only did the serfs fail to receive all the land, but they also had to pay a heavy price for the portion that they did acquire. In order to compensate the gentry for its loss of land and serf labor, the emancipation statute granted to the nobility interest bearing notes from the state equal to approximately 75 percent of the value of the land given to the peasants. The statute then required the peasants to pay the remaining 25 percent of the land’s value directly to the nobility. Furthermore, the state saddled the peasants with a mortgage of the land they received, compelling the emancipated serfs to submit annual payments to the state over a 48-year period. Although the specific arrangements tended to vary from province to province and region to region, the guiding principle was that of protecting the gentry at the expense of the peasantry. “The emancipation statute also reflected the government’s fear and mistrust of the serfs. The prospect of hordes of serfs now free to do as they pleased alarmed the state, and it took additional steps to limit peasant freedom. To begin with, title of the land was not given to individual serfs or to serf-families; rather, title was vested in the mir, or village commune, the ancient peasant body presided over by the village elders. The government counted on the hide-bound, differential, and conservative commune to rein on rambunctious, independent, ‘uppity’ peasants. It was the commune that worked out the division of the estates with the nobility, and it was the commune that assigned landholdings to the former serfs and decided for everyone in the village such basic questions as to what to sow and when to plant and harvest. Moreover, the commune periodically reassigned landholdings to its members, a process called repartition that simultaneously strengthened the hold of the commune over its members and inhibited peasant individualism. To the bourgeois-liberal theoreticians, the situation with the decree on clothing, and the arrangement for “emancipated” serfs’ movement with internal passport is neither regimentation nor autocracy nor slavery, which they find all the time in political system whenever the working people struggle to build up. Is not the decree on clothing a manifestation of regimentation the powerful impose on lives of the powerless all the time? The learned theoreticians thoughtfully deny mentioning the process initiated by the “emancipation”: “compensate the gentry” by granting “the nobility interest bearing notes from the state equal to approximately 75 percent of the value of the land given to the peasants”, and, then, “the peasants to pay the remaining 25 percent of the land’s value directly to the nobility”, and then, “compelling the emancipated serfs to submit annual payments to the state”. Does it stand like this: the “emancipated” serfs pay all the amount of price, ultimately? How do they pay? Isn’t that fertilizing soil with their sweat? And, the design of these scholars’ denial leads them to further fallacies while they engage their heads in evaluating the Revolution. However, instead of waiting for these scholars, the peasantry stood on a “manumitted” ground with all the “prospects for prosperity” as the following information, only a few from scores, from the mainstream unwrap. Tax and financial burdens, debt, micro in size as the muzhiks had no capacity to construct macro-level enterprise, gradually increasing debt, higher death-rate, seizure of micro-movable-“property” including samovars and clothing, creditors including priests, tradesmen, officials, monasteries and taverns, 100 percent interest rate, extortion, police and arrest – all are there in the world of private property. Does this sound unfamiliar in many lands today? And, doesn’t it sound interesting as monasteries and taverns turn into credit institutions? Developments followed. “Again famine […] Crops may fail anywhere, but only in Russia do they lead to such grave calamities, to the starvation of millions of peasants. The present disaster, as even the supporters of the government and the landowners are compelled to admit, surpasses in extent the famine of 1891. “Thirty million people have been reduced to the direst straits. Peasants are selling their allotments, their live stock, everything saleable, for next to nothing. They are selling their girls — a reversion to the worst conditions of slavery. The national calamity reveals at a glance the true essence of our allegedly ‘civilized’ social order. In different forms, in a different setting, and with a different ‘civilization’, this system is the old slavery, it is the slavery of millions of toilers for the sake of the wealth, luxury and parasitism of the ‘upper’ ten thousand. On the one hand there is hard labor, always the lot of slaves, and on the other the absolute indifference of the rich to the fate of the slaves. [….] In our day, the peasants have been robbed — by means of all the tricks and achievements, all the progress of civilization — robbed to such an extent that they are starving, eating goosefoot, eating lumps of dirt in lieu of bread, suffering from scurvy, and dying in agony. At the same time the Russian landlords, with Nicholas II at their head, and the Russian capitalists are raking in money wholesale — the proprietors of places of amusement in the capital say that business has never been so good. Such barefaced, unbridled luxury as that now flaunted in the big cities has not been seen for many years. It was a reality of poverty, hunger, despotism and capitalism, a reality dominated by exploiters bent on expropriating the working classes, a reality devoid of fundamental and human rights, a reality of an immense mass laboring and languishing in inhuman condition, a reality of gradual political radicalization of the people, a reality of ripening of conditions for social change, and a reality missed by a group of theoreticians engaged with evaluating the Revolution. Revolts of the pauperized and hungry followed, which was repressed with death and banishment as the following information indicate. “The number of civilians executed during the next eight months by the new field-courts has been officially reported as 683, while the ordinary courts-martial are officially credited with the execution of 10 civilians in 1905, 144 in 1906, 456 in 1907, and 825 in 1908. These figures do not include the numbers of persons executed upon administrative order, without the formality of a trial, and an unofficial tabulation places the number of such executions at 376 in 1905, 864 in 1906, 59 in 1907, and 32 for the first ten months of 1908. The total number of executions here listed is therefore more than three thousand four hundred. 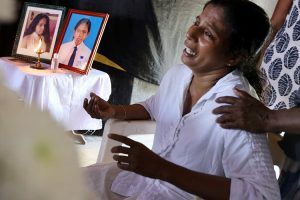 The word ‘execution’ is to be understood literally, since no account is taken here of the unknown number of persons who were shot down during the actual disturbances without first being captured by the authorities. Smeared with blood and brutality the ruling system faced a speedy shifty situation as further forces of the working people were there, and, when the forces stepped on the theater of political action, they emerged as one of the most decisive factors in world politics. It was an alliance of workers and peasants seizing political power through the Great October Revolution. The article is the 2nd section of the 5th part, in abridged form, of a series composed on the occasion of the Great October Revolution Centenary. The 1st, 2nd, 3rd, 4th, 1st section of 5th, and 6th parts of the series were originally carried by Countercurrents.org, and the series is now being carried by the web site of Frontier, an independent, radical weekly from Kolkata. A few sources referred in earlier parts have been mentioned briefly in this part. In the 6th part, the source ‘“Soviet power”, J V Works, vol. 3, Foreign Languages Publishing House, Moscow, USSR, 1953’ cited is actually ‘“Soviet power”, J V Stalin Works, vol. 3, …’. Farooque Chowdhury, a Dhaka-based freelancer, has not authored/edited any book in English other than Micro Credit, Myth Manufactured (ed. ), The Age of Crisis and What Next, The Great Financial Crisis (ed. ), and he doesn’t operate any blog/web site.